February | 2013 | Mike Lamberti, From Margate To Cleveland, And Back ! Following a victory before a large home crowd in the first round of the NJSIAA, North Jersey, Section 1, Group 3 tournament on Feb. 26, the Passaic Valley boys’ basketball team will face a big-time test on Feb. 28 when it travels to second seeded Sparta for a quarterfinal round contest. Rob Carcich’s team won’t be venturing on the long trip up Route 80 by itself, however. The Hornets will have a busload of fans heading to Sussex County, as well, in what could be “White Out” conditions. Lynch’s enthusiasm for the Green and White has always been genuine, but has amped up even more as a result of the new phenomenon at PV, better known as “Holsworth’s Heroes”, a fan base of students that got its start from PV assistant coach Jim Holsworth. A first-year teacher at PV, Holsworth challenged his students to get on board and support the Hornets early in the season, when the big gym in Little Falls was three-quarters empty, and too quiet, gaining the unenviable moniker of The Library. So, as the Hornets prepare for a big game on Feb. 28, the team will be buoyed by their fans, probably all wearing white shirts again and boasting that championship belt. So here we are, at the best weekend of the high school wrestling season, at least in my opinion. The Region 4 championships begin tonight at West Orange High, continue on Friday and conclude Saturday with the semifinals, third place bouts and the 14 championship matches. The top three wrestlers in each weight class at Region 4 will join the top three from each weight class in the other seven regions around the state from March 8-10 at Boardwalk Hall in Atlantic City. Obviously, getting to A.C. is the goal for every wrestler who has qualified for the regions. But there’s something special about the regions, especially on Saturday afternoon when the third place bouts are contested. The winner of the third place match is assured a trip to Boardwalk Hall, the loser will need a ticket to gain entrance. While the region finals are always exciting, both of those wrestlers know they’re headed to the state championships. The third place bouts have a finality to them, and the knowledgeable fans in attendance have come to respect and enjoy those matches almost as much as the title bouts. With that said, let’s take a look at all 14 weight classes at Region 4 and a prediction for the winners. 106-Nutley’s Anthony DeLorenzo gained the top seed, and he’s certainly capable in what should be a very competitive field. Watch out for DeLorenzo’s rival, Rocco Genova from Belleville, who is seeded second in the lower bracket and Caldwell freshman Dean Caravela, the District 13 champ. The choice: Caravela. 113-Having covered Passaic Valley a good part of this season, I think Tyler Tepe could win this. Michael Russo of St. Peter’s Prep is the top seed, but again this is wide open. Many of the coaches I spoke with think Jean DuBois of Clifton is the best in this class, and I have to agree. The choice: DuBois. 120-Assuming he’s healthy, Robert Trombetta of Nutley, who is the top seed, is the favorite. Watch out for Tommy Heller of Livingston, who is seeded third and could face Trombetta in the final, which would be a rematch of last weekend’s District 14 final, which Trombetta won in the closing seconds. The choice: Trombetta. 126: There are a few weight classes which seem to be heavily weighted to one wrestler. This is one of them. Anthony Giraldo of North Bergen, the top seed and a two-time state medalist, is the clear-cut choice. 132: Another class where the top seed is the hands-on favorite. Livingston’s Jason Estevez should win this, but I’m eager to see how Passaic Valley’s Tom Dunphy does here. Dunphy is the fourth seed, meaning if form holds, he’d face Estevez in the semifinals. The choice: Estevez. 138: Who knows? Ryan Burkert of St. Peter’s Prep is the top seed, and deservedly so. But a guy like Mike Dalla Riva of Caldwell, a senior, could be an interesting choice, as could P.V.’s Jala’a Darwish, who is just a freshman. The choice: Burkert. 145: As is the case at 126 and 132 pounds, this weight class has a noticeable favorite in Mike Marotti of West Essex, the top seed. Hard to dispute that. 152: This one should be very interesting. Livingston’s Brad Krosser, a two-time District 14 champ at this weight class, is the top seed, but John Faugno of Glen Ridge, whom Krosser defeated in the Essex County final, is coming off an impressive run to the District 13 title. Then there’s Carlo Zazzara of West Essex and Becton’s Tyler Loughlin, both of whom have advanced in the state tourney before. One of those four won’t be wrestling in Atlantic City. The choice: Krosser. 160: Passaic Valley coach Joe Benvenuti made an interesting choice last week, moving Nick Armagno from his usual 152 pound slot to 160 for the districts. Armagno ended up second, losing in the final to Joe Velardi of West Essex in the final seconds. Nutley’s Brandon Keena is the top seed, and he is considered the favorite by most. Something tells me that Armagno, a state qualifier last year, will be primed for this weekend and he’s my choice to win this. 170: The top seed is James Kellner of St. Peter’s Prep in a class that’s as wide open as it gets. Hard to pick against Kellner here. 182: Only a sophomore, Vin Mainiero of Nutley made an immediate impact last year when he advanced in the state tournament at 170 pounds. He’s back now, a little bigger and clearly a confident wrestler as the top seed. He’s the choice here, but he’ll probably have to get by Verona’s Frank Greco in the title bout, which won’t be easy. 195: The only wrestler in this weight class with experience past the regions is Jake Regina of Rutherford, a senior, and top seed, who is the choice here. 220: Armond Cox of St. Peter’s Prep is the top seed, having advanced in the states last year at this weight class. He could face Vin Cordasco of Cedar Grove in the region final. Edge to Cox. HWT: I really think Passaic Valley’s Patrick Andriani, who is seeded third, can win this. Last season, Andriani never got the chance to compete after being diagnosed with a weird skin ailment prior to the preliminary round of the regions. This year, he’s a district champion with a definite eye toward Atlantic City. The choice: Andriani. So, there you have it. Looking forward to an exciting weekend at West Orange High. It didn’t take long for the ambitious coach to challenge his students to pick up the school spirit for a program that has consistently won for the past seven years. Slowly but surely, the students in Holsworth’s social studies classes began showing up to home games, and then, some road games. And then tonight, ‘Holsworth’s Heroes’ showed up in droves, filling the now former Library with energy for a first-round NJSIAA tournament game between their seventh seeded Hornets and Tenafly, which gained the 10th seed. The line was out the door for tickets 20 minutes before game time, and while the gym, which holds about 1,800, full capacity, wasn’t sold out, it certainly was at least 70% capacity. (The biggest crowd I ever saw at home was in the 2010 state tournament, when PV played Wayne Valley in the quarterfinals). The PV players loved the momentum from the crowd, most of whom wore white shirts, and when Stef Minic drained a 3-point basket to start the game, it was clear that this evening belonged to the Hornets. One fan even had a championship belt, which he held proudly over his head for most of the game. On the court, the Hornets were paced by Minic’s 22 points while Mike Cirrincione had his best game on the varsity level, scoring 14 points and pulling down 10 rebounds for his first double-double. Passaic Valley won, 51-30, to advance to North Jersey, Section 1, Group 3 quarterfinals on Thursday at second seeded Sparta, which downed Wayne Hills. Passaic Valley won this game because of defense. Playing its patented 2-3 zone to near perfection, it held Tenafly to 26 points, including just five in the first 7:30 of the fourth quarter before the Bergen school added a pair of layups in the closing seconds of the game. Freshman point guard Jihad Wright had nine assists and seven rebounds. Sophomore forward Shawn Ulrich had four points, but it was a play he made early in the second quarter which turned the game squarely in PV’s favor. With the Hornets up, 13-7, an errant shot appeared to be heading out-of-bounds. But Ulrich made a great save of the ball, passing it to Dan Cirrincione, who was fouled on a layup attempt. A Tenafly player was assessed a technical foul on the play, giving the Hornets an additional two foul shots, and then possession of the ball, where Mike Cirrincione converted a layup to give the Hornets a 17-7 lead. PV lead 23-9 at the half, thanks to a beautiful layup by Wright before the buzzer. Tenafly did make things a little interesting in the third, cutting PV’s lead to 31-21 after three, but the Hornets went back to work on defense in the fourth and pulled away to a big win. Zach Damiano had another good game, scoring seven points and playing tenacious defense. Success in the state tournament is nothing new to Carcich’s team. The Hornets have been to the last two state sectional finals and were a semifinalist in 2010. Back in 2007, the program won the sectional championship and went to the Group 3 final. Following the game, most of Holsworth’s students reported to their teacher that they were indeed at the game. And the Hornets live for another day in the craziness of the state tournament. Next up, a long trip to Sparta, where a huge assignment waits. Let’s see if Holsworth’s Heroes travel well. Here they are, Region 4 wrestling fans. The complete brackets for the upcoming tourney. Enjoy ! They are in Excel format. Finally, it’s over. Over 6 hours after it started, the Region 4 seeding meeting is complete. Here are the top seeds for all 14 weight clases. I’ll have my predictions on the region coming up on Wednesday. The Region 4 tournament starts Wednesday at West Orange High in a 6 p.m. start. Wrestling continues on Friday with the quarterfinals, then concludes on Saturday with the semifinals, wrestlebacks and 14 championship bouts. The top 3 wrestlers in each weight class at Region 4 will move on to the NJSIAA championships at Boardwalk Hall, from March 8-10. Having done my share of writing for nearly 38 years, I will admit there are a few stories that resonate for a lifetime. When it comes to high school wrestling, there is, by far, one which stands out. 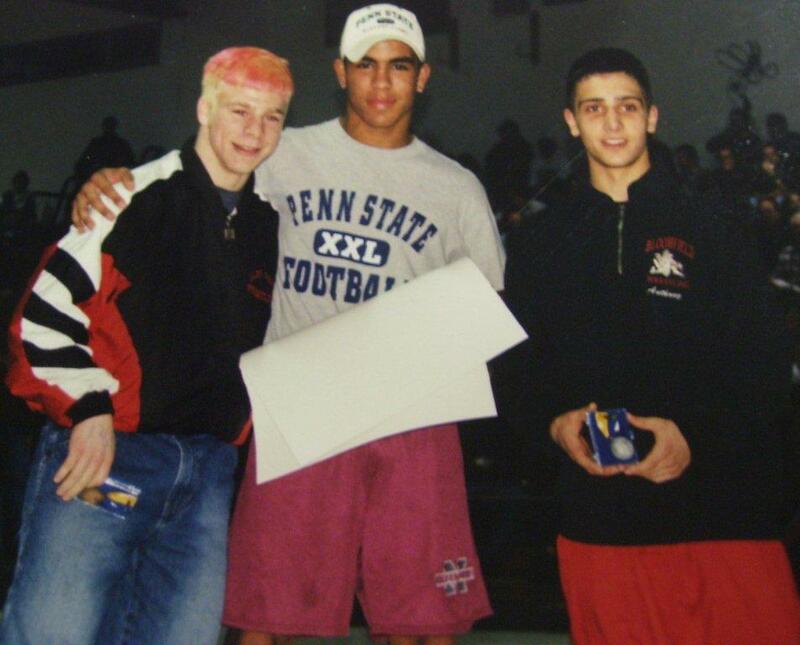 It happened 12 years ago and comes to mind specifically this weekend, as the Region 4 championships are once again contested in Northern New Jersey. Long after the final whistle sounded, and the cheering ended on a wrestling mat in North Jersey, three friends remain tied to each other, in part due to a weekend 12 years ago that will forever bond them. It’s what makes high school wrestling, and its subsequent competition, so special. And while the friendship amongst the three had begun long before a fateful weekend in March of 2001, what occurred over a seven day period a dozen years ago has forever changed their lives. It’s a story of courage, raw emotion and the ultimate victory which would alter Dubuque’s life and strengthen a friendship already cemented in respect. Even in elementary school, Dubuque was a wrestling fanatic. His idol growing up? Belleville High’s Anthony Conte, a 1996 state champion and Belleville’s lone four-time NJSIAA medalist, to date. After beating LaPorte, Dubuque had another hour to try and recoup before he faced Lou Rabelo of North Bergen for third place. Only the top three wrestlers from each weight class advance to the state championships, so there was just one way for Dubuque to qualify. The extra hour seemed to do him some good. His eyes were much clearer and he seemed more focused. Okay, so Passaic Valley didn’t repeat as District 13 wrestling champion. It lost by a half a point. Yes, half a point. And to West Essex, of all teams. And as head coach Joe Benvenuti said afterward, there’s no one to blame. There was no one more disappointed than Benvenuti as he made his way to congratulate West Essex head coach Greg Ruggiero. And when a Hornets fan made a comment about a stalling call which didn’t go Patrick Andriani’s way in the heavyweight bout, Benvenuti put a quick end to that discussion. For Benvenuti, this was about Andriani and Tommy Dunphy winning district titles. It was about Nick Armagno, Tyler Tepe, Anthony Cruz, Jala’a Darwish, David Cruz and Christopher Armagno advancing to the regions, with Darwish and Chris Armagno making it as freshmen. And despite the difficulty of losing by such a slim margin, it once again enhanced a wonderful rivalry with West Essex, a school where Benvenuti began his head coaching career and where his legacy as a classy young coach took hold. Two West Essex assistant coaches, Mike D’Urso and Rick Nappi wrestled for Benvenuti at West Essex and are now up-and-coming coaches at their alma maters. The coach wouldn’t have it any other way. West Essex won in classic manner in District 13 while Nutley pulled away in the championship round for a solid victory to repeat as champion in District 14 on Feb. 23. The top three wrestlers in each weight class at Districts 13 and 14 will move on to the Region 4 championships to join those wrestlers who attained top three rankings in Districts 15 and 16. The regions begin at West Orange High on Feb. 27 with the preliminary round for grapplers who were second and third in their respective weight classes. Wrestling continues on Friday, March 1 with the quarterfinal round, where the district champions will compete, along with those wrestlers who won on Feb. 27. On March 2, the semifinals, wrestlebacks and 14 championship bouts will be contested. The top three wrestlers in each weight class at Region 4 will move on to the NJSIAA championships at Boardwalk Hall in Atlantic City from March 8-10. West Essex edged (and I mean edged) the defending District 13 champs, Passaic Valley, 173.5-173.0 in North Caldwell. The tournament came down to the heavyweight bout, where Passaic Valley’s Patrick Andriani won the title but missed out on a bonus point despite an opponent who appeared to be stalling. Had he scored that additional point, PV wins the district. Joe Velardi of West Essex won a huge bout in the 160-pound championship, edging Passaic Valley’s Nick Armagno, 9-8 on a reversal as the final buzzer sounded. West Essex also got a one-point win over Passaic Valley in a title bout at 113 pounds where Mike Panzarino nipped Tyler Tepe, 2-1. PV’s Tommy Dunphy was impressive in a tough weight class, winning the 132-pound championship. Once again, we saw the intensity of the Passaic Valley-West Essex wrestling rivalry. The Hornets won the regular season battle, the Knights captured the post-season tussle. Last year, it was just the opposite, with West Essex beating PV by criteria in a dual match and the Hornets returning the favor a few weeks later in the districts. And with the closeness of the schools and the familiarity among the coaches (Benvenuti was head coach at West Essex before returning to his alma mater and some of the West Essex assistant coaches wrestled for Benvenuti in high school) this rivalry has plenty of steam left for the 2013-2014 season. Meanwhile, at District 14 in Livingston, Nutley rallied in the championship round to defeat upstart Belleville for its second straight district title. Belleville made a stand by advancing nine wrestlers to Region 4, but the Raiders stepped up in the final 14 bouts, winning three titles against Belleville opponents to pull away from the Bucs. Nutley’s Robert Trombetta won the 120-pound title with a come-from-behind 5-4 win over Livingston’s Tommy Heller in what was clearly the match of the day. Anthony DeLorenzo, Stephen Scuttaro, Brandon Burbank, Brandon Keena and Vin Mainiero also captured gold for Nutley. Livingston’s Jason Estevez was named the tourney’s Outstanding Wrestler for his dominance at 132 pounds while in District 13, Mike Marotti garnered OW after winning the 145-pound title for West Essex. Next stop, Region 4. Can’t wait. Nutley actually trailed arch rival Belleville heading into the final round, but the Raiders captured three head-to-head matches with their Buccaneer opponents and also got some bonus points in the form of pins by Brandon Keena at 160 pounds and Vin Mainiero at 182. Robert Trombetta of Nutley won a thriller, edging Livingston’s Tommy Heller, 5-4, in a tremendous match at Livingston High for the 120-pound District 14 title. Trombetta trailed, 4-3, before reversing Heller off the edge of the mat with less than 5 seconds remaining. Trombetta’s win also gives Nutley the team lead in a close tournament. Nutley’s Anthony DeLorenzo won at 106 pounds while Brendon Seyfried of Newark Academy won the 113-pound championship.